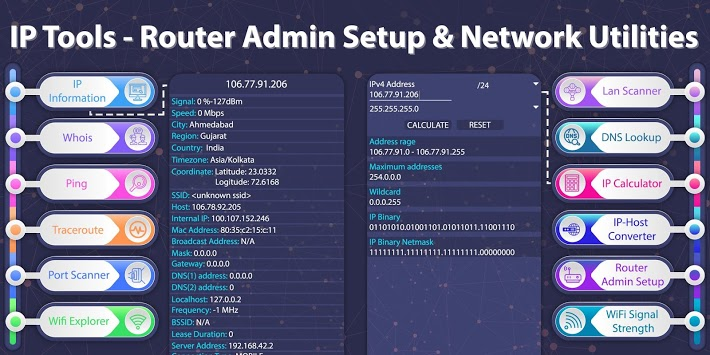 IP Tools - Router Admin Setup & Network Utilities is a powerful and helpful network toolkit for speed up and setup networks. 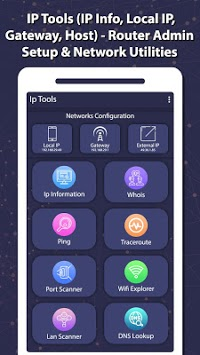 It allows quick detecting any computer network problems, IP address detection and checking network performance with pings and dns lookups. - Whois : gives you the ability to lookup any generic domains to find out the registered domain holder. - Ping : Shows how long it takes for packets to reach host. - Traceroute : Traces the route of packets to destination host from our server. - Port Scanner : allowing you to quickly find open ports on running network. 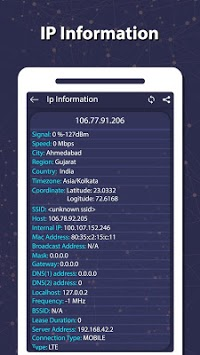 - WiFi Explorer : list all WiFi connections which is available to connect near to you. - DNS Lookup: tool to find the IP address of a certain domain name. The results will include the IP addresses in the DNS records received from the name servers. - IP Calculator : takes an IP address and calculates the resulting broadcast, network, wildcard mask and host range.